My hubby described these this way, "like eating dry wall, only less enticing." These were gummy and unappealing. I won't be making them again. These were fabulous- the texture was good and the melty chocolate with dried strawberries tasted divine. I was concerned that whole wheat scones would feel dry but they were wonderful. This quick bread is really unique and delicious. This is the first recipe I have tried from this book and now I'm really excited to try others. This was not great. The applesauce (I made her recipe) made the granola soggy rather than crispy. I will continue my search for the perfect granola. These were okay but we weren't crazy about them. I think I would have liked them to be a bit sweeter. These were easy to make and delicious. The whole grain flours seemed to add an extra layer of nutty flavor. These cookies are so appealing! They have a lovely texture with the nuts, butter and bits of dried fig. They are not very sweet but the combination of flavors results in a beguiling caramel flavor that is hard to identify. My husband was sure they had chocolate in them. I used a tablespoon to scoop out the dough because a teaspoon seemed too small. The cookies were probably bigger than what Ko had in mind but I thought they were perfect. The bigger cookies needed an extra three minutes in the oven. Delicious! I thought it would be too sweet, but it wasn't. I made 1/2 recipe, which was plenty. The coconut turns a lovely golden color on top, but it does make it impossible to cut cleanly. Will remember this if I ever need to make a gluten-free dessert. This was very fragrant, moist and tasty. It came out perfectly after about an hour and ten minutes. I will make this again! This is the second recipe I have used from this book and it makes me want to bake everything in the book. This cake is perfect! The almond taste was delicate and the apricots provided tiny, bright bits of flavor. It wasn't too sweet- just perfect. We all had seconds! This is fast becoming my favorite baking book. The recipes are appealing and everything I make is unique and delicious. This cake is perfect. The pistachios and orange zest lend a lovely perfume. It's not overly sweet. The texture is lovely. I can't wait to have more with coffee tomorrow morning! Chose this recipe because it was super simple and dairy free. Very moist, rave reviews! Served with lemon sorbet and strawberries. I really enjoyed this cake: not too sweet and leftovers are great for breakfast. It was a little dry, so perhaps serve with some type of sauce or perhaps cook for less time to start. This was good but not as good as other recipes I tried from this book. There was very little batter- I could barely cover the bottom of then pan, carefully spreading it with the offset spatula- and I had a feeling that there was a mistake in the recipe. Either the pan should have been smaller or there should have been more batter? The end result was good but I think it would have been better with more cake/batter. This was not a success. The torte ended up being about half an inch thick. It was difficult to transfer to a plate because it was so thin and delicate. The flavor wasn't great, either. I'm not sure what went wrong, as I love all the components but the finished product wasn't great. My husband ate one bite and pushed it aside. I didn't finish my piece, either, which is rare. This was a rare disappointment in a book full of treasures. This was pretty disappointing. The figs weren't the best quality so that may have been part of the problem but the cake part was lacking in flavor and might have been a bit sweeter. It tasted of pistachio but nothing else. Not sure I'll make it again. This is delicious. 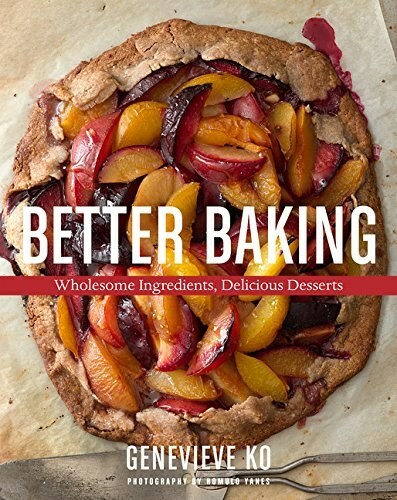 Like many recipes in this book, it was sweet enough to feel like a treat but it wasn't cloying. The goat cheese added a subtle flavor that added nuance for the grown ups but was undetectable to the children. The walnuts provided welcome crunch. We ate leftovers the next morning crumbled on top of plain yogurt, which was AMAZING! Genevieve proves that wholesome ingredient swaps in baking can deliver delicious results. Updating classic baked goods with flavorful whole grains, nuts, flours, fruits, vegetables, and fats. After more than a dozen years developing recipes for food and health magazines and collaborating with noted pastry chefs, Genevieve Ko was determined to create treats that were just as indulgent as their original counterparts, as well as more full flavored and nourishing. In a word, better. Healthful oils prove superior to butter, giving Mocha Chip Cookies crisp shells and molten insides, liberating the citrus in Lemon Layer Cake with Olive Oil Curd, and tenderizing Melting Walnut Snowballs. Refined white sugar pales beside concentrated sweeteners like pure maple syrup, brown sugar, and molasses in muffins and granola. Pomegranate Pistachio Baklava uses reduced pomegranate syrup instead of the usual saccharine one. Nubbly flours with personality—whole wheat, spelt, rye, buckwheat, graham flour, and almond flour—bring richness to such desserts as Glazed Apple Cider Doughnuts. And pureed fruits and vegetables (beets in Red Velvet Roulade with Strawberry Cream Cheese; grated zucchini in Chocolate School Party Sheet Cake) keep desserts extra moist.